- This carbon part is meant to replace the lower rear black plastic part on the original bellypan supplied with the Panigale V4. It is completely compatible to fit directly with the front painted portion of the bellypan. - Form and fit as Ducati original plastic portion of the bellypan with the exception we made a more generous opening for the side stand. - but with our part you can modify the bellypan from the serial standard exhaust and make your bike compatible for an Akrapovic Slipon System. 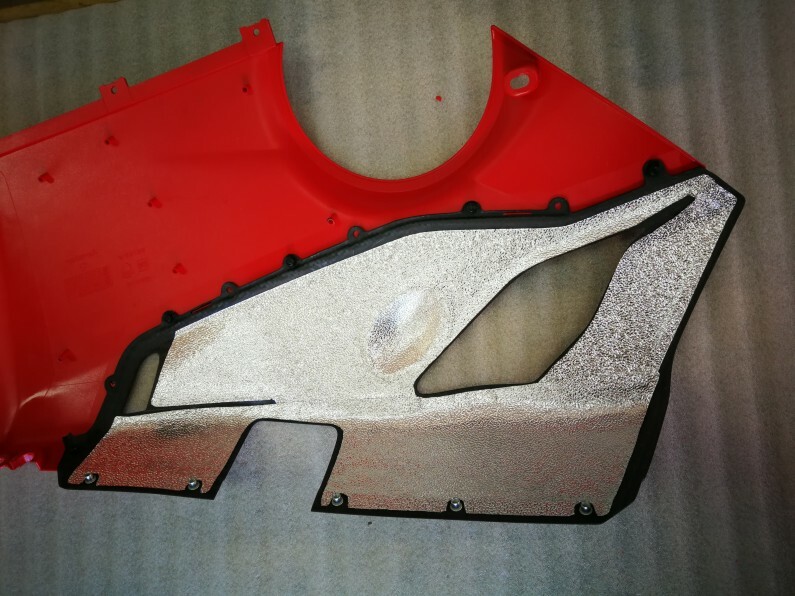 - Shipped ready to install. - Included is a complete Mounting Kit. For the instructions see below. 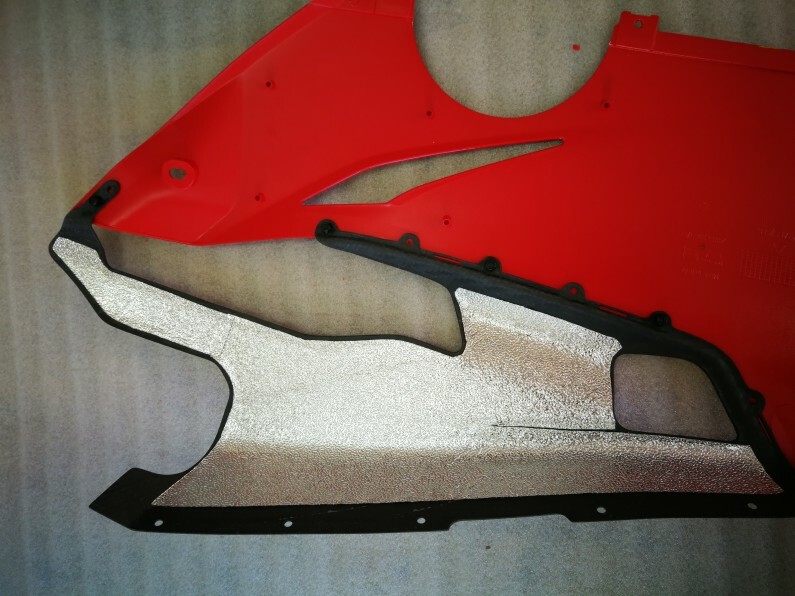 - Your choice of matt or gloss finish. 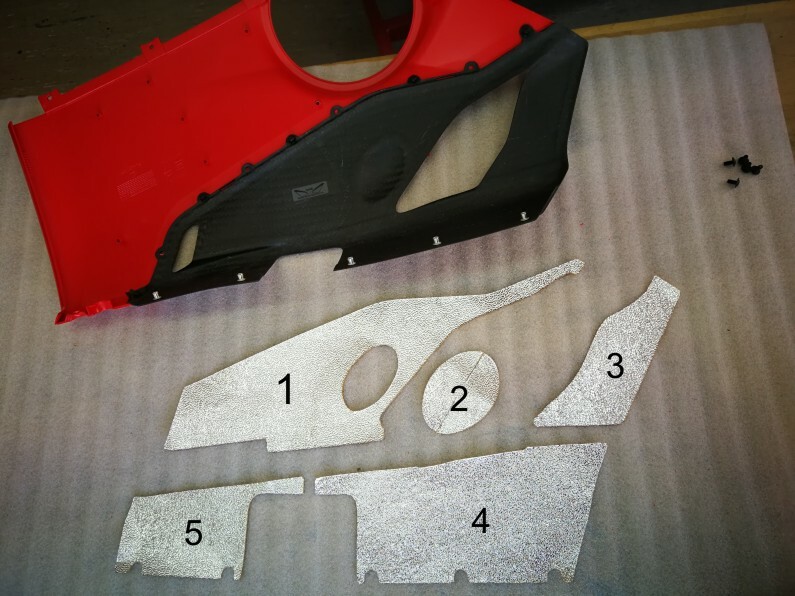 The assembly of the bellypan is a bit complicated, take your time, read thru everything at least once and get all the tools you are going to need laid out. 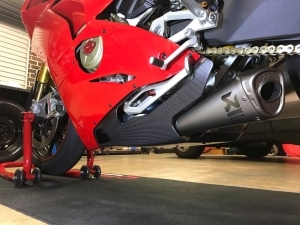 If you follow the steps in the instructions even a less experienced mechanic can pull this off. 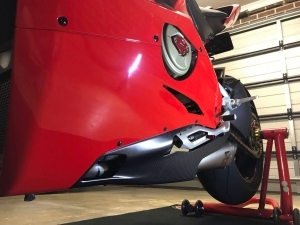 Before you start it will be necessary to remove the complete bellypan from your Panigale V4. Then lay the right and left sides apart in front of you. 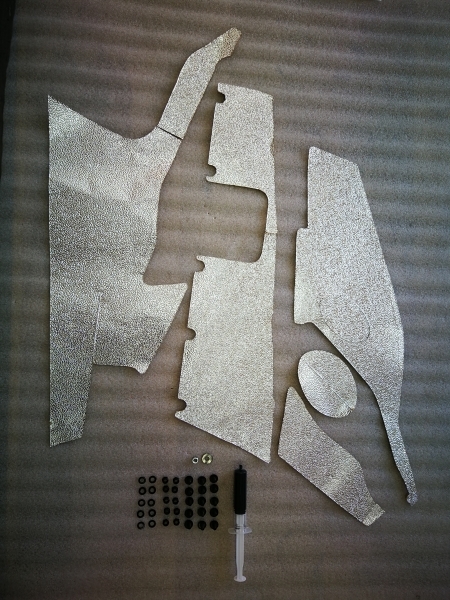 You can lay everything out on the foam packing material that the bellypan will not get scratched or damaged. 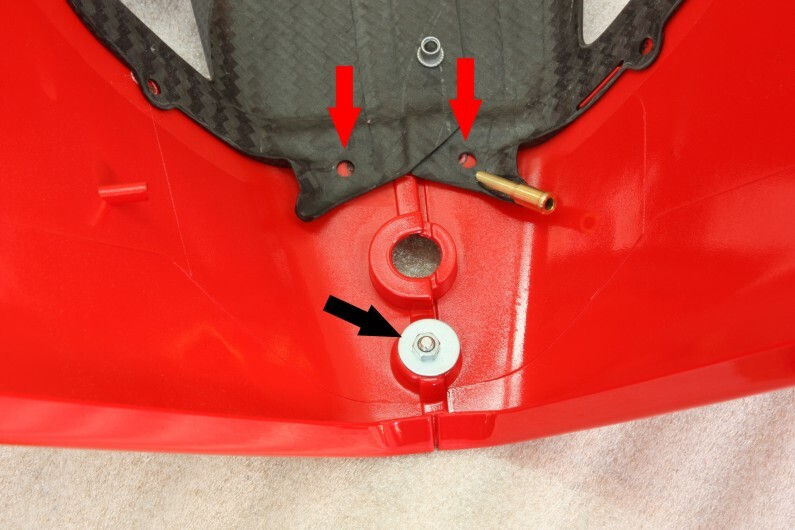 The original black plastic section of the belly pan is attached with high frequency welds - Show with red arrows in photo below. 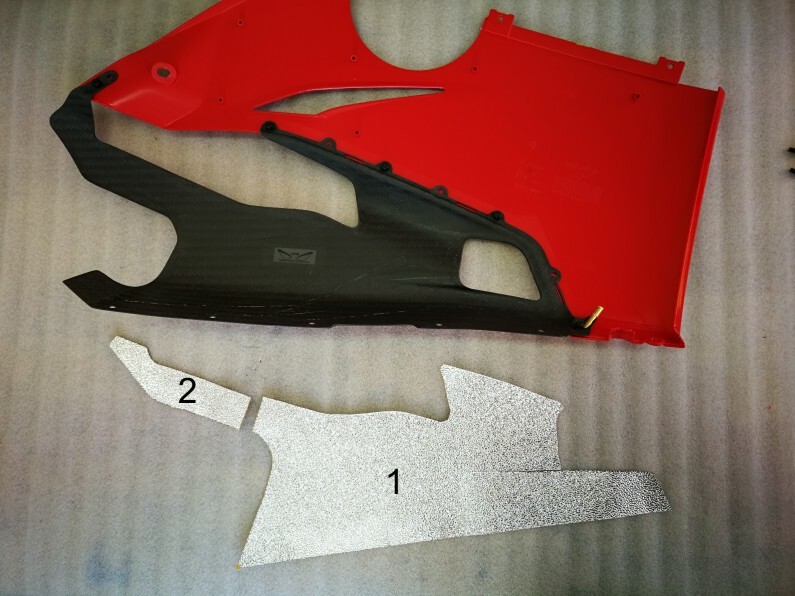 To release these welds please use the following method. After trying several ways, this works the best. 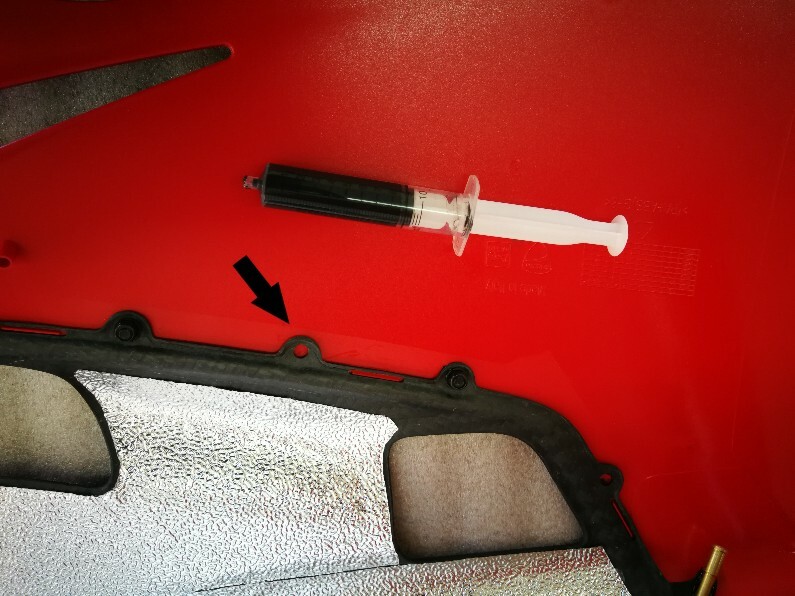 Using your hand, take the 10mm drill bit in the middle of the actual point the part is attached by the weld- you will see this is not always perfectly centered. 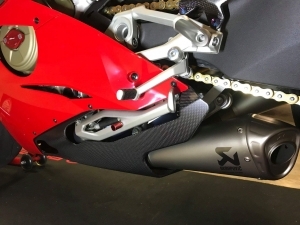 Gently and carefully turn the bit until you see the first red shaving. Stop. 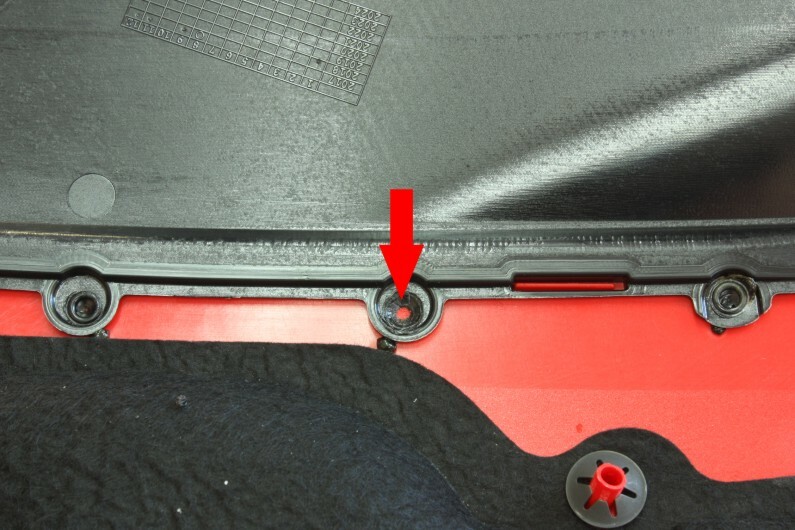 You are not trying to make a hole in the red part of the belly pan, just digging out the soft black welding plastic, to be able to release the sections from another. 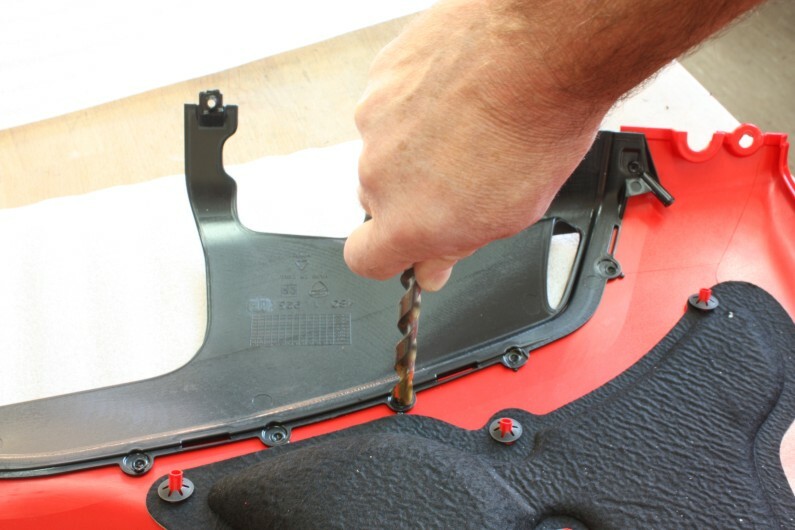 This should only require a couple turns from the drill bit. 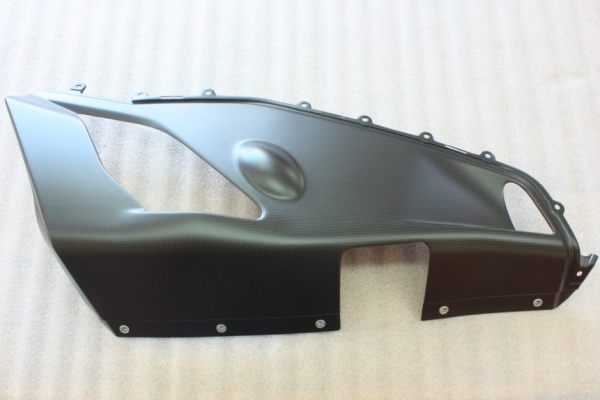 Now at a slight angle turn the drill bit by hand until the weldpoint looks like the 3rd photo. 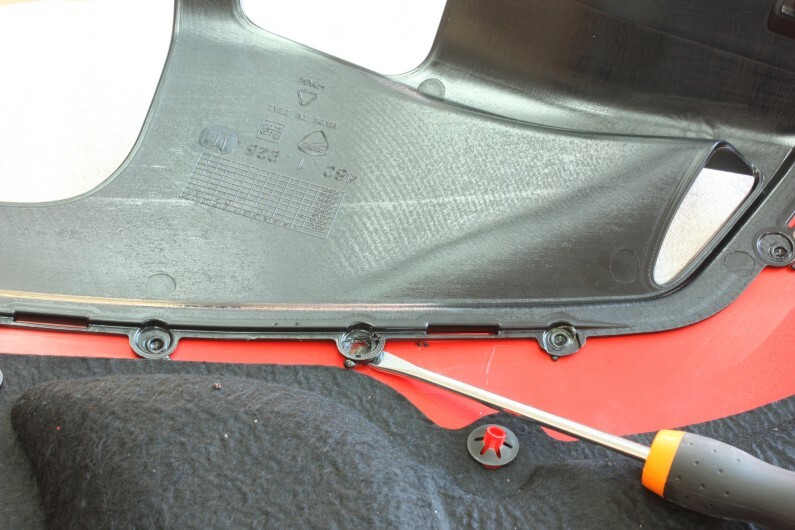 Using the screwdriver, carefully place it between the weldpoint and the red part and loosen them by one turn of the screwdriver. 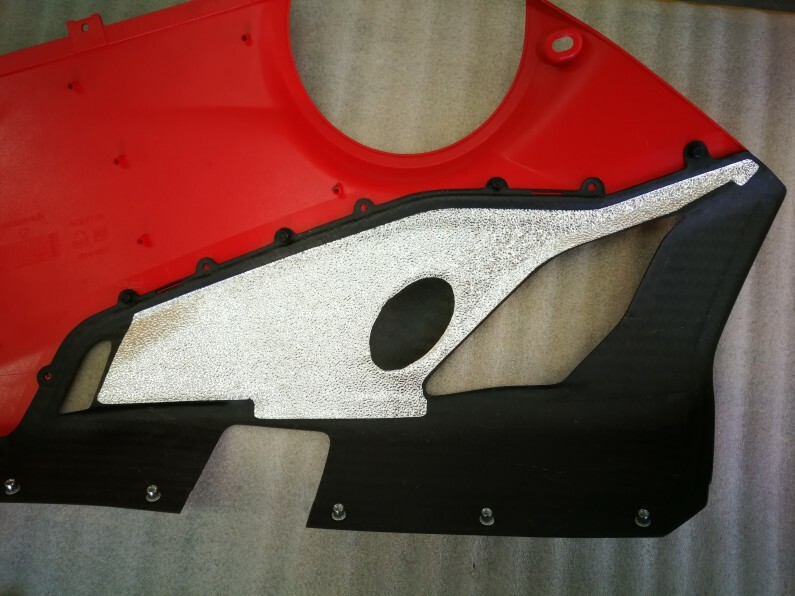 Work along each welding point until you have removed the entire black section from the red section. 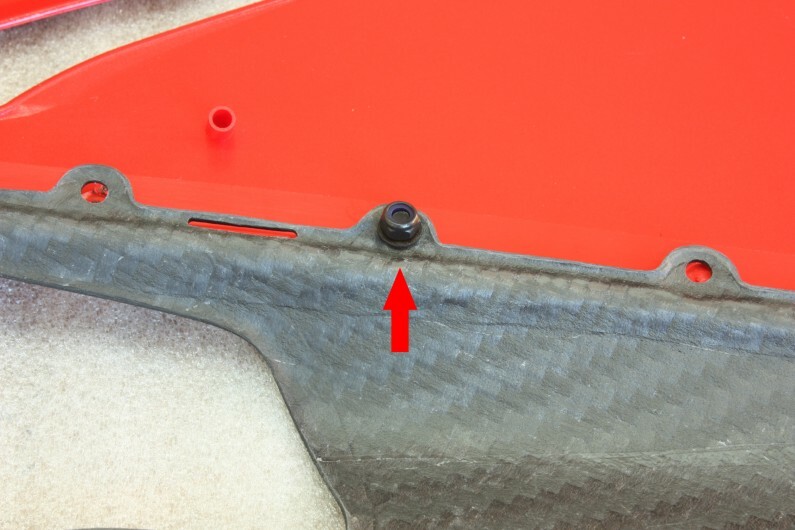 The carbon part does not need to utilize every mounting opening, we only use every second one to screw on the carbon onto the red section. Next take your marker and mark the holes shown on the red arrows. 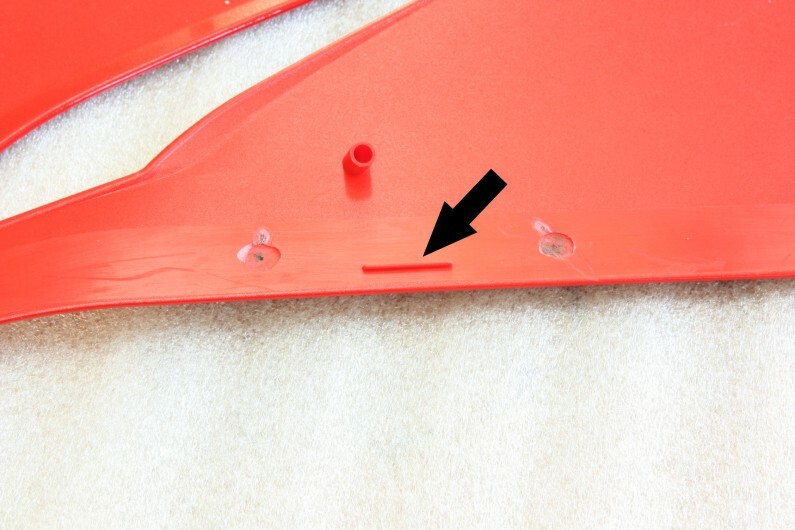 This is REALLY helpful not to drill to many holes in the red section by mistake which happens pretty fast with plastic (trust me on this one). 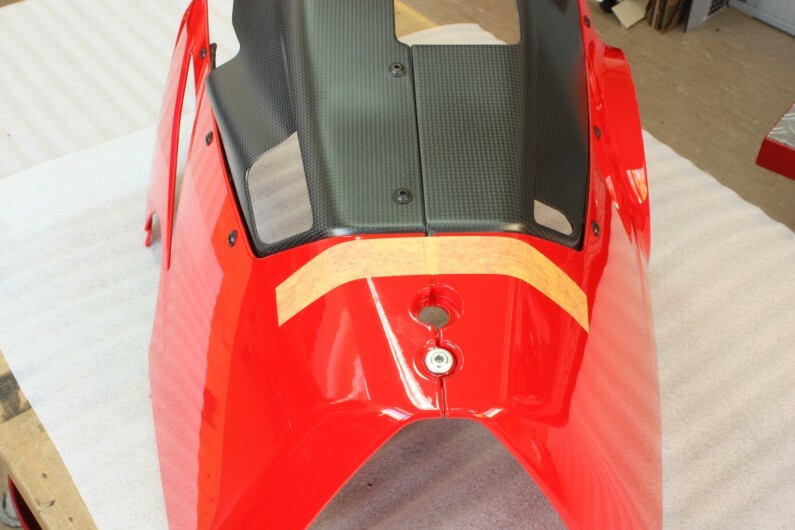 Start on the left side start by laying the carbon part and the red section together. 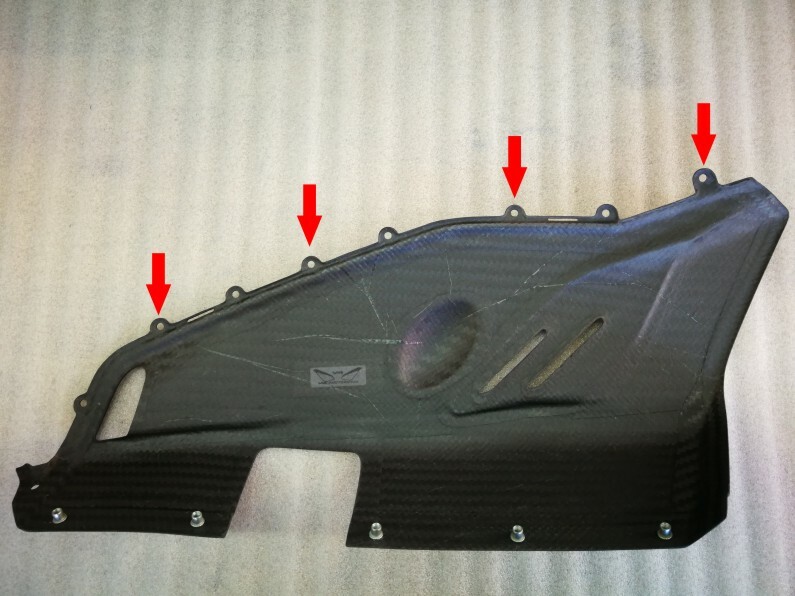 There are alignment slits on the red part and our carbon part which you need to use to properly line everything up. Shown below with arrows. 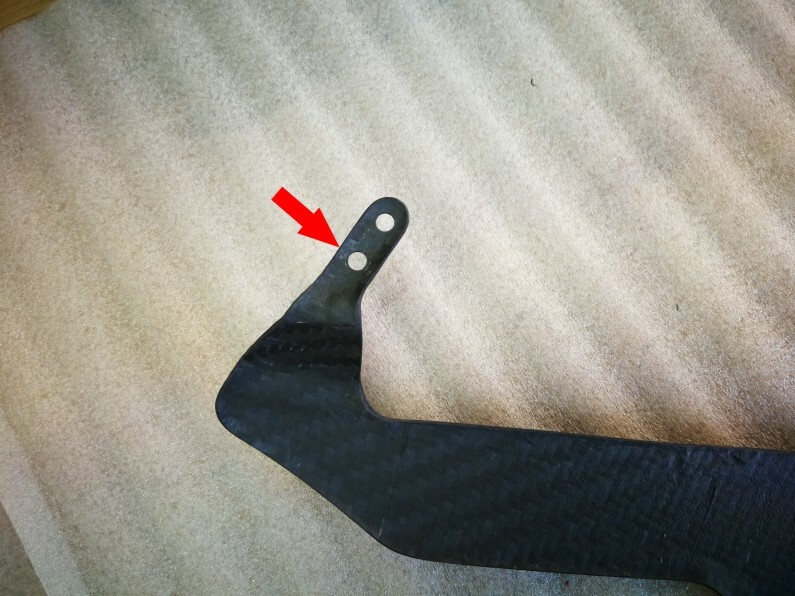 Place the carbon and the red section so the the 3 slits are exactly aligned. Use the masking tape to hold them in place, and for giggles just check again that the alignment is perfect. 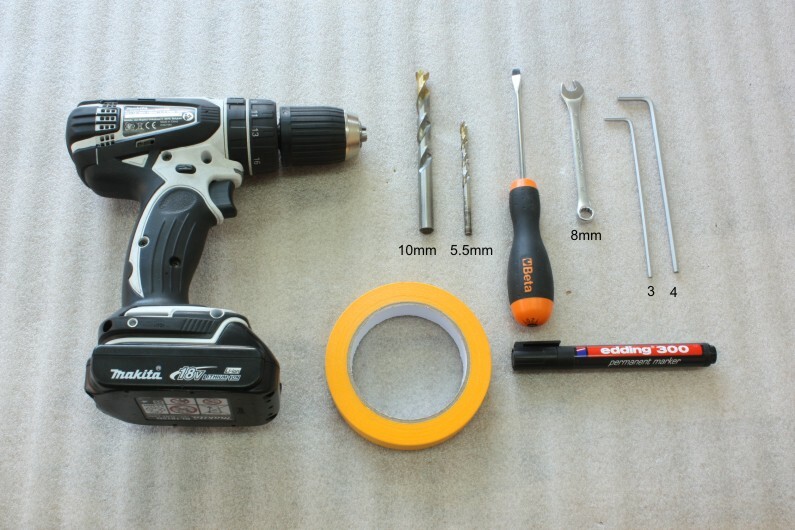 Fit your screwgun with the 5,5mm drill bit and from inside drill a hole in every second marked opening on the carbon. You did mark them, correct? Drill at a slow speed carefully. 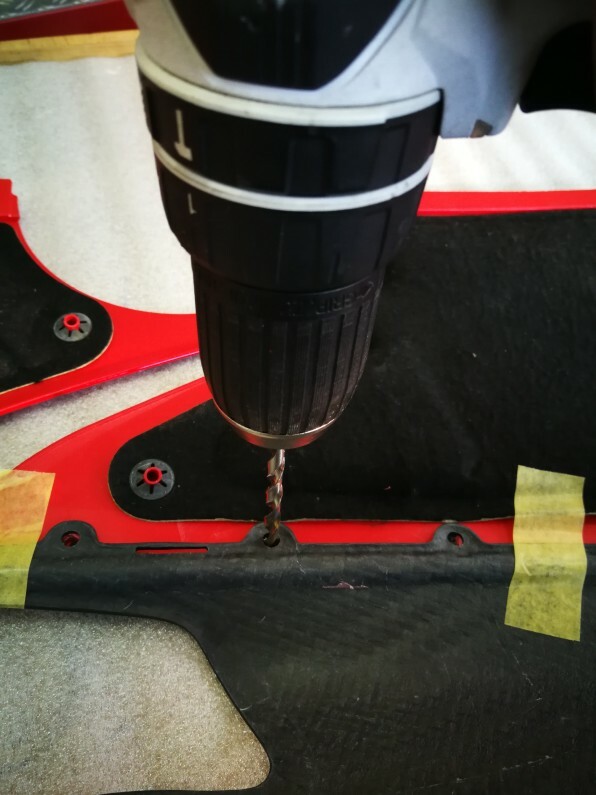 Before starting to drill the next hole, first attach with the M5x10mm screw with the nuts and washers supplied in the Mounting Kit. Then proceed to the next marked opening on the carbon. 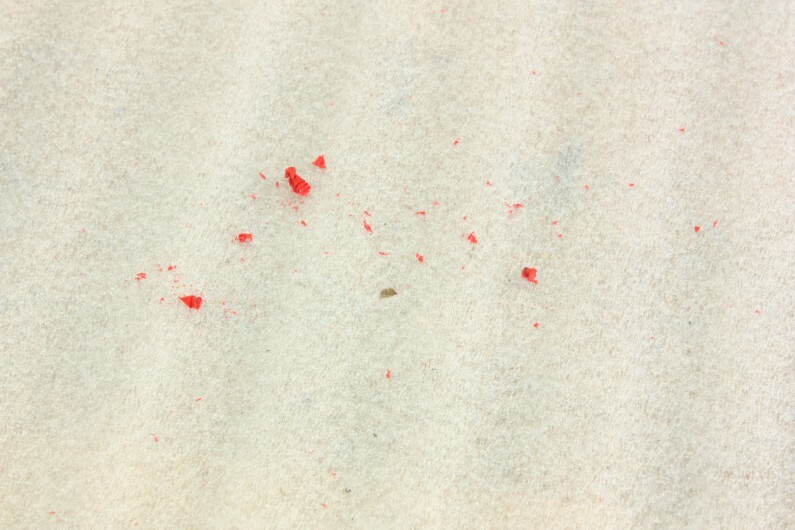 Remember to clean away any shavings each time you drill, since these can scratch your bellypan. 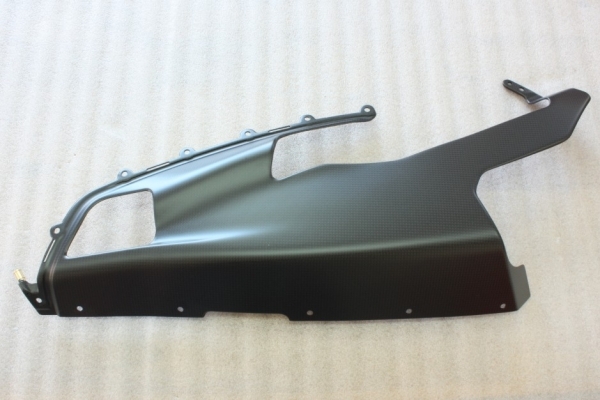 Now you can finish the other side. 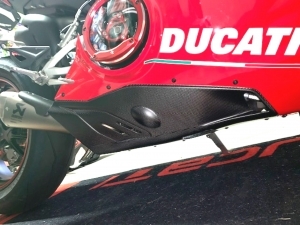 Now you can attach both sides together with 5 M5x10mm screws. 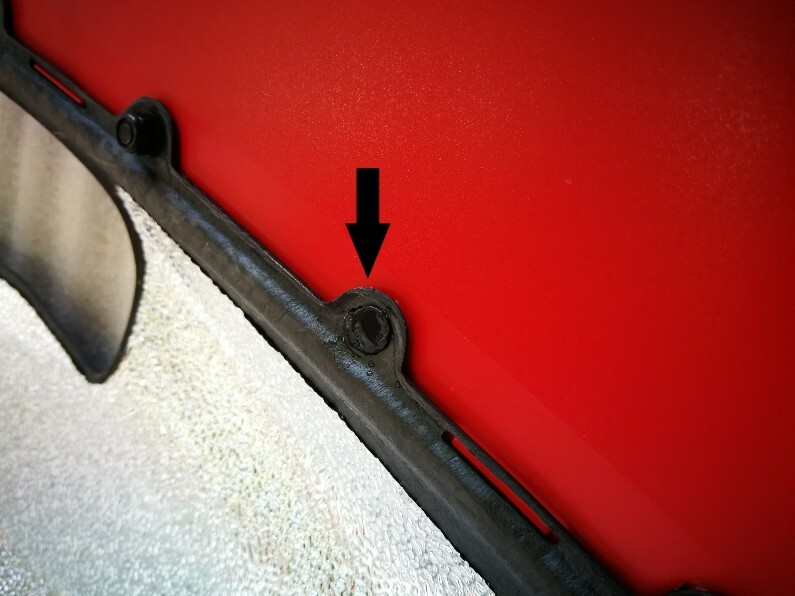 To temporarily hold the 2 sides together utilize the original screw/bolt for the front larger hole (that attaches to the cooler guard) by using a washer and nut we provided. 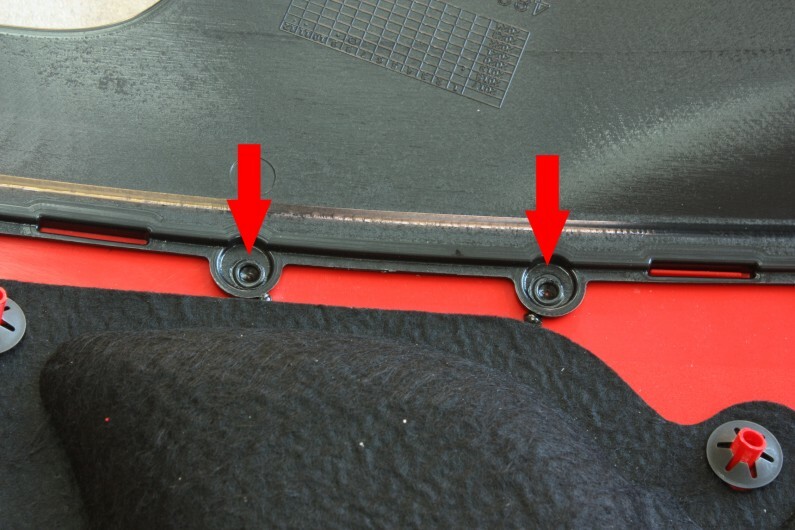 Use the masking tabe to hold the bellypan together. The next step is to drill the final 2 holes (pictured below) in the bellypan. 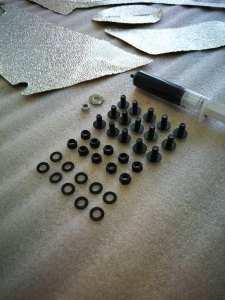 Then screw them together with the M5x10mm screws using the washers and nuts. 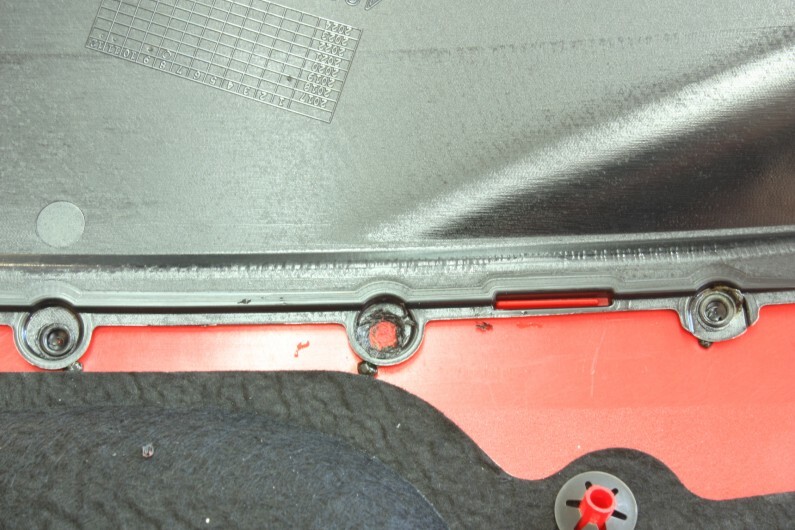 Now unscrew the 2 sides from another along the middle of the bellypan to apply the heat protection foil. Go step for step, paying attention to the numbers. Laying them out logically is the best approach. 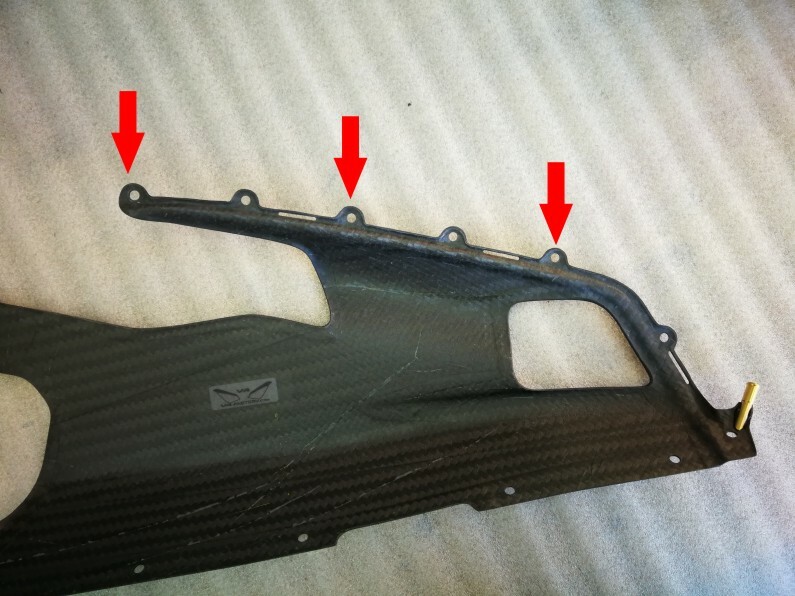 To address the un-drilled tabs on the carbon part we will be using adhesive that is supplied in the Mounting Kit. Have a cup with some soapy water nearby before you start. 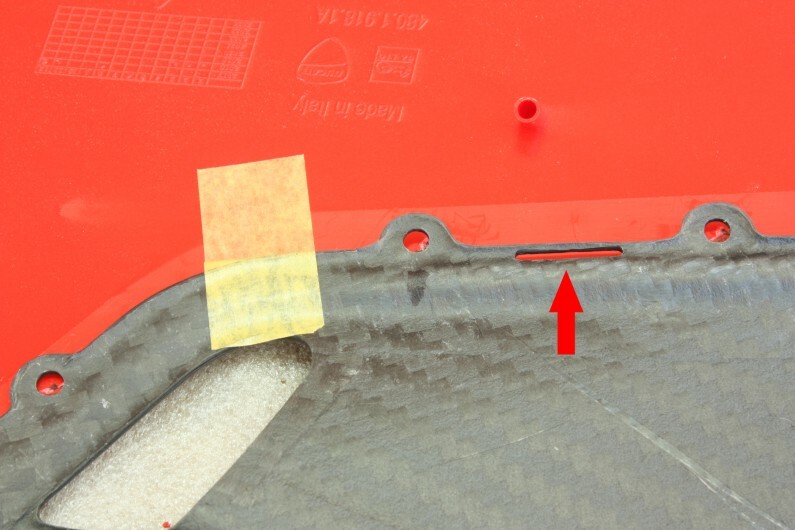 Press the un-drilled a bit away from the red section, then apply the adhesive so that a little bit seeps under the tab. 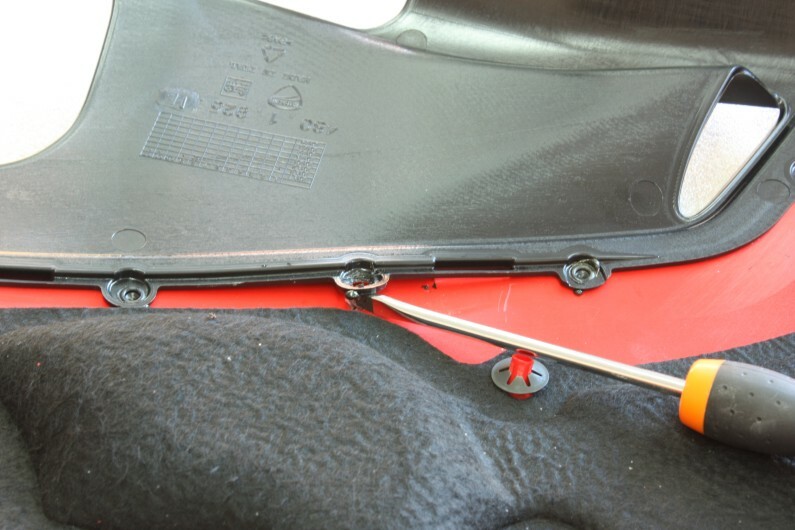 Then release and fill the rest of the hole with adhesive. Dip your finger in the soapy water and tap the adhesive smooth. OK, good work,you can now mount your bellypan back on your Panigale V4!